Flexibility – Whether donors’ charitable interests are broad or narrow, donors can accomplish virtually any charitable purpose through a fund with the Foundation. Permanence – Gifts of endowment benefit the community forever. Donor Services – The Foundation is able to assist donors with their charitable interests, providing information about community needs and connecting them with local non-profits. Simplicity – Donors decided what, when and how to give, and for what purpose. The Foundation takes care of the ongoing administrative and reporting details. Local Benefit – Grants focus on needs close to home, in our local community. Relevance – If a fund’s purpose becomes obsolete, the Foundation’s Board can redirect the Fund to address similar needs in the community. Donor intent is our highest priority. Tax Advantages – A community foundation offers the the maximum tax benefits for charitable giving. Cost Effective – The Foundation currently underwrites our fund fees, so 100% of donated dollars go to community impact. Recognition – Donors can choose the level of recognition they wish. Some donors enjoy having a named fund within the Foundation. Other donors prefer to remain completely anonymous. 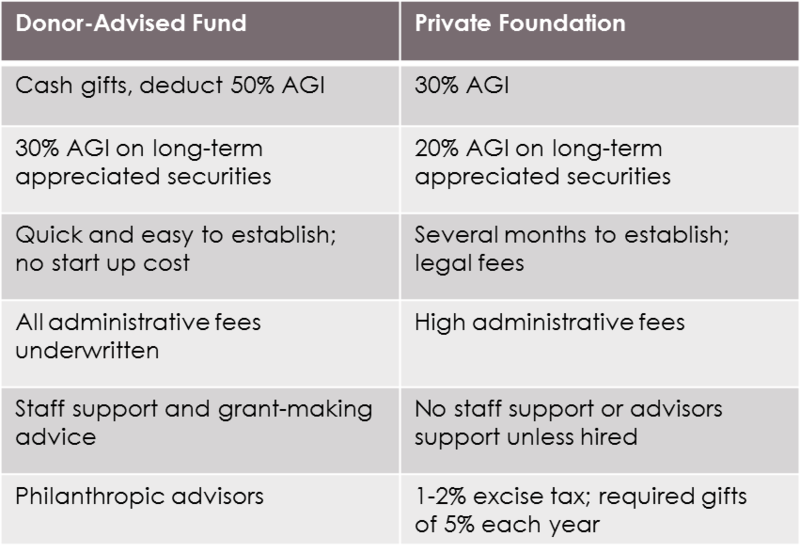 There are many differences between public and private foundations. Some of the most important are reporting requirements and tax benefits to donors.